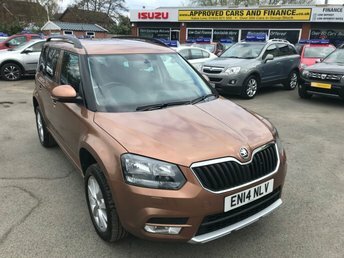 APPROVED CARS AND FINANCE ARE PLEASED TO OFFER THIS SKODA YETI 1.2 SE TSI DSG 5 DOOR AUTO 103 BHP IN METALLIC BRONZE WITH ONLY 24,000 MILES ON THE CLOCK AND A FULL SERVICE HISTORY, THIS VEHICLE HAS GOT A GREAT SPEC SUCH AS FULLY AUTOMATIC GEARBOX, AIR CON, ALLOY WHEELS, PARKING SENSORS (REAR) AND MUCH MORE. THIS IS A PERFECT FAMILY VEHICLE DUE TO THE SIZE AND VERY ECONOMICAL A LOW ROAD TAX. 2014 14 SKODA YETI 2.0 OUTDOOR TOUR DE FRANCE TDI CR 5 DOOR 138 BHP IN WHITE WITH 92000 MILES ANS A GOOD SPEC INCLUDING SAT NAV. 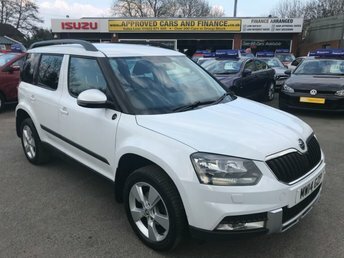 APPROVED CARS ARE PLEASED TO OFFER THIS SKODA YETI 2.0 OUTDOOR TOUR DE FRANCE TDI CR 5 DOOR 138 BHP IN WHITE WITH A GOOD SPEC INCLUDING SAT NAV,ALLOYS,BLUETOOTH AND MUCH MORE WITH A FULL VOLKSWAGEN SERVICE HISTORY A GREAT LOOKING/DRIVING YETI IN THE BEST COLOUR WHITE. 2015 65 SKODA FABIA 1.2 SE TSI 5d 89 BHP IN SOLID BRIGHT RED WITH A BLACK ROOF AND MIRRORS WITH ONLY 20000 MILES AND ONLY 1 PRIVATE OWNER. APPROVED CARS ARE PLEASED TO OFFER THIS SKODA FABIA 1.2 SE TSI 5d 89 BHP IN SOLID BRIGHT RED WITH A BLACK ROOF AND MIRRORS IN IMMACULATE CONDITION INSIDE AND OUT WITH A GREAT SPEC INCLUDING AIR CON,MEDIA POD,ELECTRIC WINDOWS,BLACK ALLOY WHEELS WITH A FULL SKODA SERVICE HISTORY SERVICED AT 9K AND 15K A STUNNING LITTLE SKODA AN IDEAL SPORTY RUN AROUND. 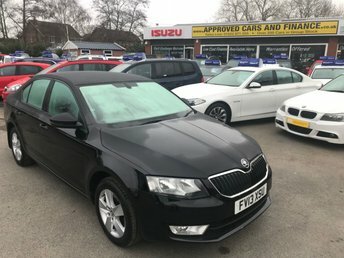 Get a great deal on a used Skoda for sale in East Peckham when you come to Approved Cars Ltd (Approved Cars Izusu). Pay us a visit today to browse the latest range of pre-owned Skoda models available, from economical hatchbacks through to executive saloons and crossovers with character. Find yourself behind the wheel of a used Skoda Citigo and find out how much fun you can have in the urban playground. Alternatively, discover whether the Skoda Yeti with its sturdy looks and practical nature is the car for you. View our complete line-up of used Skoda models for sale in East Peckham here on the website and feel free to contact the team to find out more.